Kittens already have cute little whiskers but can you imagine coming across a kitty that has a perfectly, gentleman-like mustache printed on his furr? 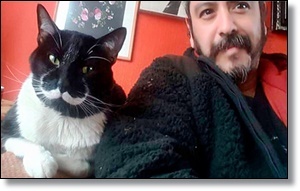 This is what happened to Dali the cat’s humans’ when they found and adopted him, he stood out with his wonderful stache! Not only does Dali look like a gentleman, he acts the part, being a super chill cat, always watching over his human and just being one handsome kitty.